NOTHING OOZES hubris like Barack Obama putting on a humble act. "There's a point where the vanity burns away and you've had your fill of your name in the papers, or big adoring crowds, or the exercise of power," the president tells historian Doris Kearns Goodwin in an "exit interview" published by Vanity Fair. "And for me that happened fairly quickly." Since he no longer revels in his own grandeur, he explains, he won't fall into the trap of making decisions out of ambition or "thirsty" attachment to the prerogatives of office. Historian Doris Kearns Goodwin interviewed President Obama in the White House dining room. Five years ago, Obama claimed that his accomplishments compared favorably to those of any president with the "possible exceptions" of Lyndon Johnson, Franklin D. Roosevelt, and Abraham Lincoln. Now he says that if he'd been blessed with "the genius of an Abraham Lincoln or the charm of an FDR or the ... legislative acumen of LBJ," his terrific record might have been even more terrific. So when Obama says that the "vanity burns away," what he apparently means is: Nothing changes. There's certainly not much he thinks he should have changed. "There aren't a lot of situations where I look back and I say, The decision I actually made or the course we actually pursued was the wrong course," he tells Goodwin. To be sure, the catastrophe in Syria "haunts" him "constantly," and he sometimes asks himself what he "might ... have done differently along the course of the last five, six years." But he dismisses that idea as quickly as he raises it. Obama rejects any suggestion that his refusal to intervene as Syria imploded into the world's worst human-rights calamity might have been misguided. Hundreds of thousands dead, millions uprooted, refugee flows not seen since World War II, chemical weapons deployed with impunity, Russian warplanes back in the Middle East, the horrific rise of Islamic State, the stunning destruction of ancient Aleppo — Obama is quite sure his inaction had nothing to do with any of it. "Arguments about what could have been done are wrong," he declares. Arming the rebels? Putting teeth into his "red line" warning? Imposing no-fly and safe zones to protect civilians? Heeding the 51 State Department diplomats who publicly urged the administration to carry out military strikes against Bashar Assad? "All those things I tend to be skeptical about," Obama says loftily. Perhaps "a Churchill" or "an Eisenhower" might have come up with a better strategy, the president tells Goodwin. But he doesn't really believe it. After all, "the only problems that come to my desk are the ones that nobody else can solve." If this president had a theme song, it would be Edith Piaf's "Non, je ne regrette rien." Thanks to Obama's feckless foreign policy of appeasement, retreat, and "leading from behind," he will leave his successor a bloody, terror-filled planet, vastly more dangerous and chaotic than the one he inherited. In his fervor to pull US troops out of Iraq, to shrink America's global footprint, and to prove that a less assertive United States would yield a more peaceful world, Obama has presided over disaster. But he's confident that no one else could have done better, and he regrets nothing. "There's a point where the vanity burns away," Barack Obama says in a new interview. 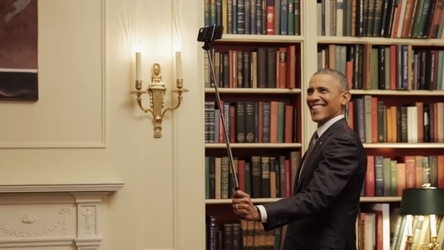 Above, the president makes a BuzzFeed video of himself playing with a selfie stick. Early in his presidency, addressing the United Nations for the first time, Obama intoned: "I am well aware of the expectations that accompany my presidency around the world." A few days later, the chairman of the Norwegian Nobel Committee proved the point, announcing that Obama would be awarded the 2009 Nobel Peace Prize for his "extraordinary efforts" to increase international harmony and cooperation. Years later, the Nobel Committee came to regret its 2009 decision. But Obama is blissfully free of any such misgivings. He knows, after all, that everyone who disagrees with him is wrong.